The Mammut Adamello is a very light (373g, size UK12) yet still robust-feeling jacket made using highly breathable Gore-Tex Pro Shell and with all the key features for winter use. The two high hipbelt-compatible side pockets and main zip are water-resistant, the former with no stormflap for extra protection, the latter with a wide stormflap behind. There is no chest or arm pocket, and no inside pocket, which helps keep the weight down. There is more durable fabric at the shoulders, upper arms and around the lower back and hips for extra abrasion resistance and durability under backpack straps and hipbelt. Mammut’s new hood design works nicely with both vertical and horizontal adjustment that draws it in comfortably around the head for a good fit; and while there is no wire in the peak, it is quite wide and rigid enough to take a substantial battering by the elements. There is no means of stowing it away when not in use however. One nice touch is extra brushed-cotton-feel fabric around the chin and lower cheek area, which makes wearing this jacket with the hood up a very comfortable experience. The men’s version of the Mammut Adamello is the Albaron. 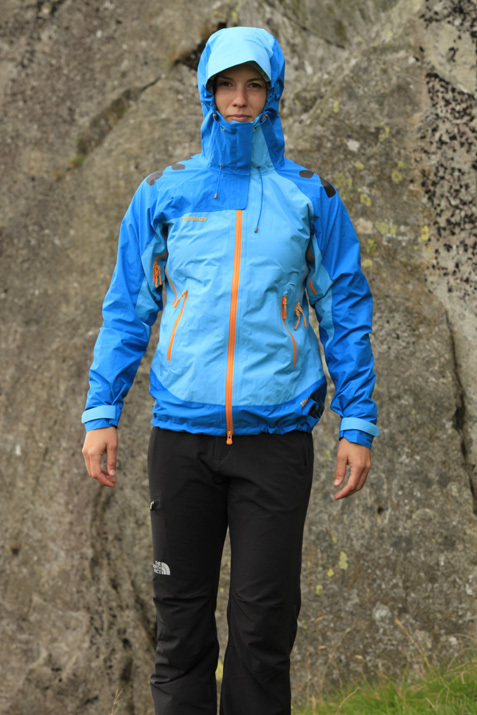 The Mammut Adamello is a very light but robust-feeling option with only the key features that you really need.